I bought a new pair of shoes yesterday. Conventional wisdom has it that all women love buying shoes and indulge in this activity whenever possible. I disagree. I fecking hate buying shoes. My problem isn’t with style decisions, but size. Well, style, too, but more of that later. The minute I’m in the car with the shoe box on the front seat I start to bubble over with stress. A year or so ago I bought a good pair of walking boots which turned out to be an unacceptable fraction too large (they moved at the back of the ankle with every step) and I’d been around the park a couple of times with the dogs before I overcame my denial, so I felt it was unfair to give them back to the shop. It took me an eternity to find a second hand buyer for a pair of boots. 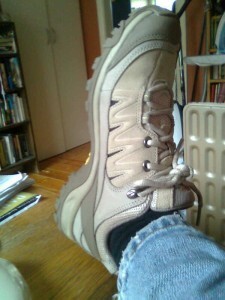 My latest pair is a pair of low-cut walking shoes for everyday dog walking and such. I need something with good foot support and tread – Dunlop volleys don’t cut it with my crap knees and feet. Now I’m sitting here wiggling my toes and getting up to circumnavigate the house another time and being Neurotic. Are they too big??? Are they too big??????OMG? Of course they look enormous, but I have to accept that I have enormous feet. There is just an infinitesimal amount of movement. But it is first thing in the morning. I’m fairly certain they are The Ones. Yes, I should have decided this in the shop, but that is not the way my mind works. On the drive home from the Shopping Mall from Hell and overnight my fearful Wrong Size fantasies burgeon until I’m convinced they are flapping boats in which my feet roil about from one side to the other, while people point and say “Look, it’s Krusty the Clown!” Then I put them back on, and nope, they seem to touch my feet at all points except the bit at the end where I can wiggle my toes, the old test learned in childhood. And the next size down really was very snug. These are from a bushwalking shop, again. My first call was to the sport shoe shop which rhymes with Toot Blocker, because they’re supposed to be good at fitting your feet, but Aaaaaaargh! My eyes! I am not going to put these shiny, white-silver-metallic-fluoro monstrosities anywhere near my feet. Sorry. Can’t you make some in, say, plain red or grey or black (not those orthopaedic-looking black ones) for the rest of us? As you can tell, I’m not a sporty person, so I don’t go into these places. I was surprised to see that the price of my bushwalking boots was not as ridiculous as I’d thought; people appear to regularly drop similar amounts on these metallic horrors. Good grief, you’ll say, how do you ever buy shoes for work? Well, my three pairs of work shoes: Low heels (black), purchased 2003; Mary Janes (black), purchased 2005; Boots (black), purchased 2007. That should tell you something. Good thing I work in IT. I’m pretty sure I’m not going to have to go back to the shop today. Behold my tremendous feets. Yes, very beige. …Yeah, Went back. Came back with the same shoes. Not too big. Of course, they’re too beige, but since today’s design philosophy is to make all sporty shoes look as horrible as possible, I give up on that one.